The world is at the brink of ruin . . . or is it salvation? Astaroth has been weakened, and the demon Prusias is taking full advantage of the situation to create an empire of his own. His formidable armies are on the move, and Rowan is in their sights. Rowan must rely on Max McDaniels and David Menlo and hope that their combined powers can stop Prusias's war machine before it's too late. But even as perils loom, danger stalks their every move. Someone has marked Max for death and no one is above suspicion. Should the assassins succeed, Rowan's fate may depend on little Mina whose abilities are prodigious but largely untested. And where is Astaroth? Has he fled this world or is he biding his time, awaiting his next opportunity? In the Tapestry's fourth book, author-illustrator Henry H. Neff boldly raises the stakes in an epic tale of mankind's struggle to survive in a world now populated by demons and demigods and everything in between! HENRY H. NEFF has been a successful business consultant in Chicago and a popular high school teacher in San Francisco. He now writes and draws full-time from his home in Brooklyn. 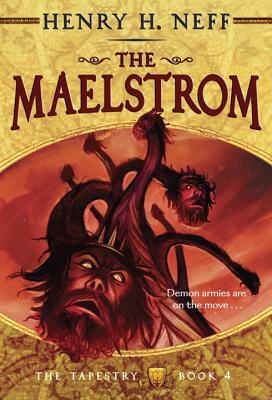 The Maelstrom is his fourth book. "Within its fantasy world, Neff makes this book a kind of in-depth consideration of war itself. Covering espionage, disinformation, false diplomacy and even cryptography, he gives readers an education in the clandestine tools of war. Despite heavy themes, he continues to balance seriousness with a lighthearted humor that keeps the pages turning. A strong, gutsy chapter in what is already a noteworthy series."